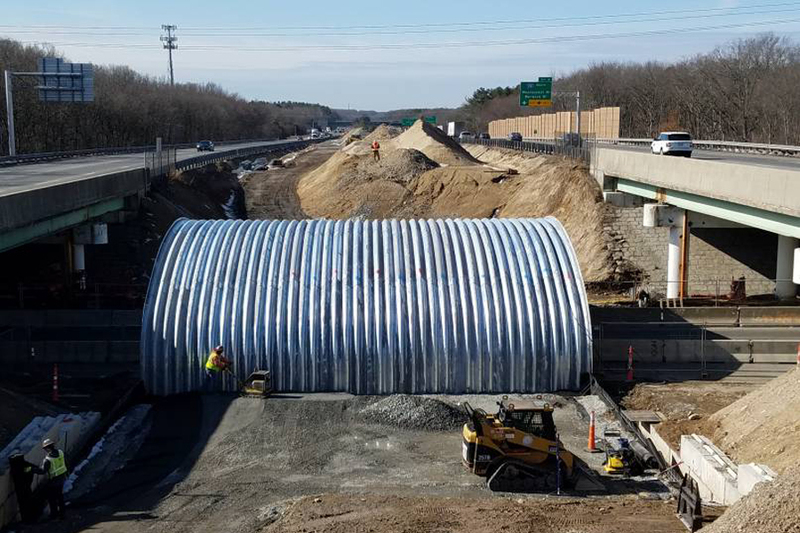 This project involved the replacement of twin three-lane bridges for Interstate 95 (I-95) over North Ave. in Attleboro, Mass. The project specifications called for the construction of a conventional temporary bridge in the median to carry the three lanes of traffic for the northbound or southbound bridge as that bridge was being replaced. During the bidding process, J.F. White (the contractor that ultimately was awarded the project) inquired about the possibility of using a Buried Bridge as the temporary bridge rather than the specified bridge. The temporary bridge had to allow for the passage of two lanes of North Ave. traffic plus sidewalks below the interstate while not changing the road elevation of I-95 above. The custom deep corrugated structural plate Buried Bridge was able to provide the needed clearance without changing the road grades. This was the first deep corrugated structural plate Buried Bridge constructed on a Massachusetts Department of Transportation project. The value-engineered Buried Bridge came in about $750,000 less than the cost of the specified temporary bridge structure. With the elimination of deep foundations, bridge abutments, the removal of the temporary bridge abutments and piles, approach slabs, and the heavy equipment required to construct and deconstruct the temporary bridge, the cost savings are estimated at well over $1,000,000. In addition, it is estimated that project time savings were more than four months. The contractor was allowed one weekend to close North Ave. and completed assembly of the 100-plate structure in one day. The Buried Bridge also provided safety enhancements by eliminating the need for heavy equipment (pile-driver and cranes) and significantly reducing construction time. This project illustrated the cost, time, foundation, safety, and accelerated bridge construction benefits of using Buried Bridges as an alternative to traditional bridges. For more information on this project, visit Big R Bridge here.